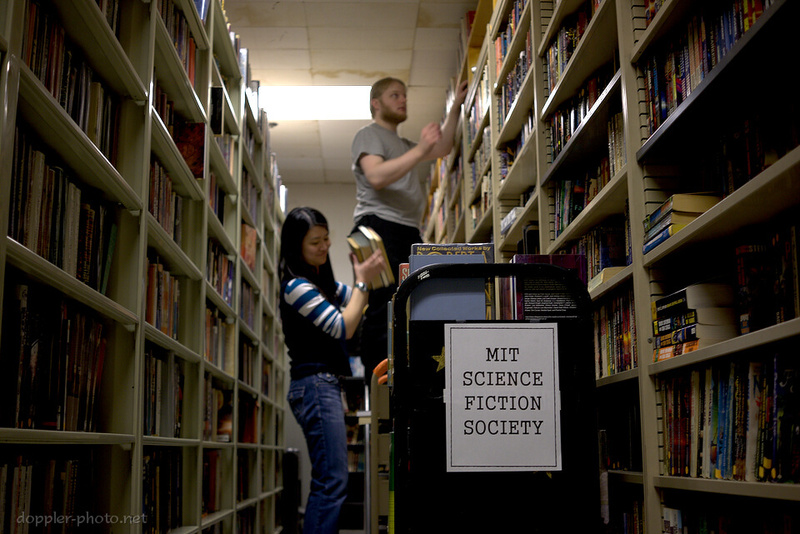 Two years after a similar undertaking in 2013, the MIT Science Fiction Society (MITSFS) closed over a weekend in January to perform another phase of reorganization. The overarching goal was to make books easier to find in the library. 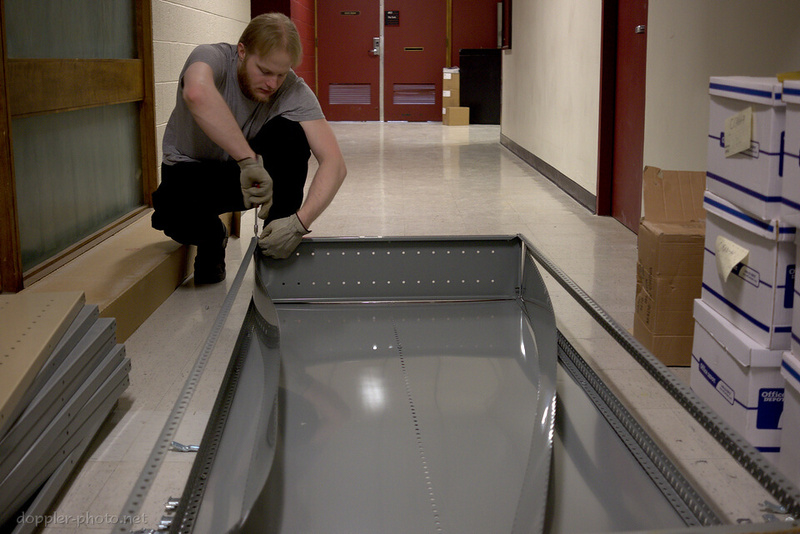 The group attempted to accomplish this by moving shelving units to improve consistency and continuity, and by packing the already-shelved books more densely, so as to make space for books that couldn't yet fit in the library's main location at W20-473. In the photo, Cathy Zhang '09 (left), the person who organized and oversaw both this and the 2013 reorganization projects, prepares to pass books to Benjamin J. Kaduk G, as they reshelve items which had been pulled by D.W. Rowlands G and James M. Penna '15 (not pictured). Zhang estimated that MITSFS now circulates around 46,000 books, not including a total of around 4,000 reserve books which can be read in the library. Kaduk disassembles a bookshelf that was no longer needed. 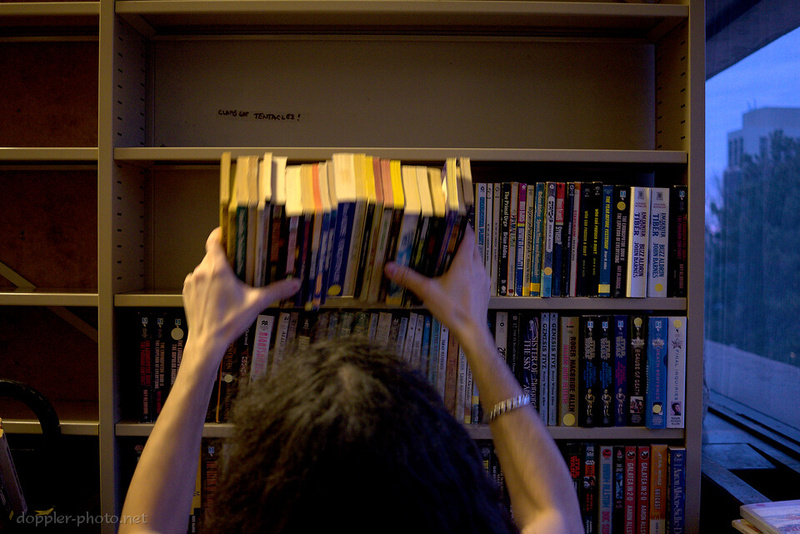 After the 2013 reorganization the library was left with a multi-aisle jump in the middle of the paperback section — comics, magazines, references, and paperback anthologies filled the gap. Because of the differing heights of the paperbacks and the other items, the shelves needed to be completely emptied so that they could be physically moved and/or reconfigured to reunite the paperback section. That process was among the work that transpired over the weekend. The reorganization allowed MITSFS to shelve some of the hardcover books which had been sitting in boxes until space could be made. 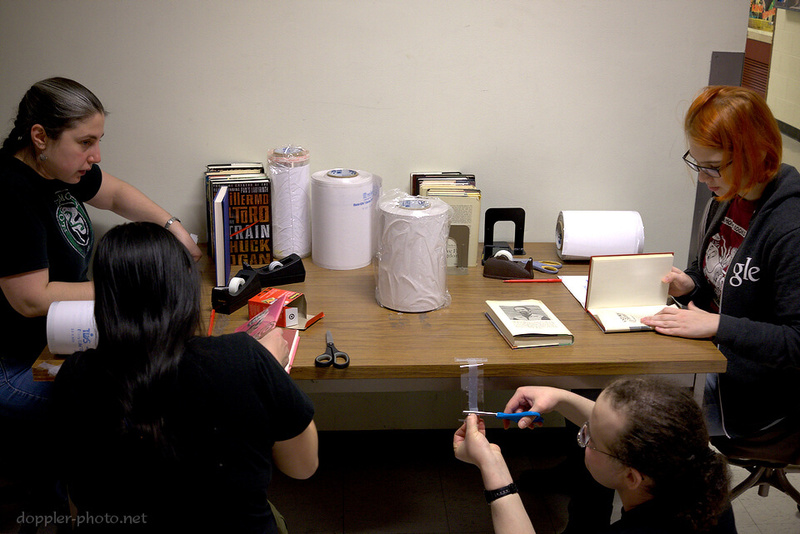 Here, (left to right) Yelena Tsitkin '06, Jennifer Chung '02, D.W. Rowlands G, and Laura A. McKnight '15 work together to add custom-sized protective covers to the dust-covers of those books before they are shelved. Chung explained of the covers, "it's why library books look shiny!" As part of the effort to defragment the paperback section, James K. Hobin '16 re-shelves an armful of books which were pulled by Jade Wang G (not pictured). As Hobin and Wang finished, the defragmentation of the paperback section was mostly complete. Monday evening found the reopened MITSFS library in this state. 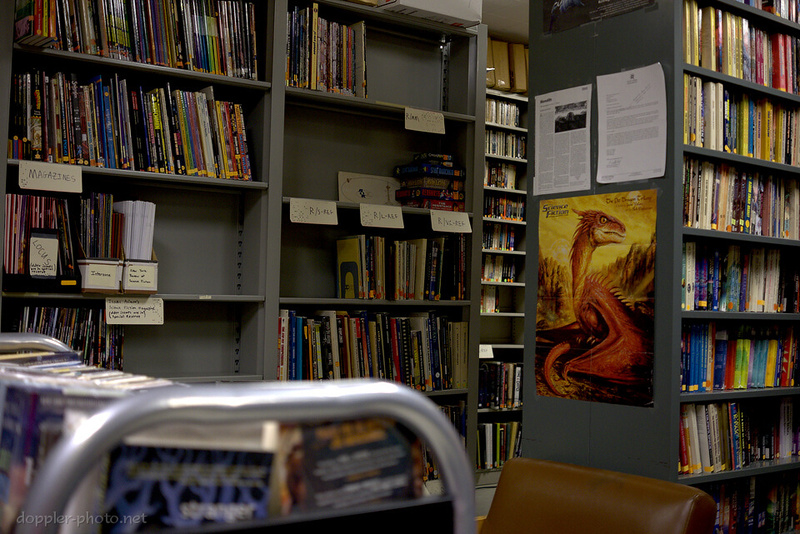 The now-contiguous paperback section extends off to the right, and the taller-spaced shelves of comics, magazines, and references occupy the area to the left. Over 300 books were added to the circulating collection, split between the shelves in the adjoining room — home of the hardcovers and large paperbacks — and the "to be shelved" shelf elsewhere in the library. Slightly over 100 books went back into boxes, perhaps to circulate another day. Note: A redacted version of this essay appeared on page 7 of the January 14, 2015 issue of MIT's student newspaper, The Tech. The prior reorganization was covered in MITSFS Reorganization Touches 40K Books, which appeared on page 6 of the January 16, 2013 issue.